Comprenew’s new computers-for-parents program helps financially challenged families acquire a home computer and training. Comprenew’s goal is to close the digital divide while setting up families for success. Comprenew launched a pilot program last fall to address the digital divide that exists in our community. 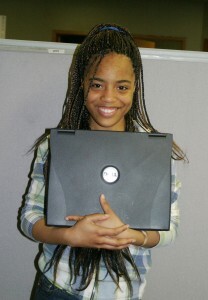 The computers-for-parents program is called This Is My Computer™ (TIMC) and is being offered to parents of school-age children in Grand Rapids area schools. The TIMC program is growing. Comprenew initially partnered with Parent University, which already had a wide range of classes in Grand Rapids Public Schools, and was interested in adding computer training. Last fall a total of three classes were completed. Twenty-five people graduated and received computers at the end of training from the Comprenew-Parent University classes. This winter, five more classes were held. Forty more parents completed the training and went home with computers. Currently, another round of sessions is being offered in the Grand Rapids area, and more are in the works. Comprenew is also talking with potential partners in Kalamazoo, Lansing, Detroit and Chicago about the Comprenew TIMC computer-training program. To find out how your organization can host TIMC classes, or if you would like to participate and join a session, please contact Jerry Ford at (616) 451-4400. Comprenew celebrates 30 years of giving back to the community through educational outreach programs, recycling of electronics, data security, computer and mobile-device repair services, and selling affordable refurbished electronics to residents and corporations. As a nonprofit organization, Comprenew’s mission is to inspire environmental care, and to increase vocational preparedness through education for all people and segments of society, regardless of religion, ethnicity, or status, through best-practice technology recycling services. 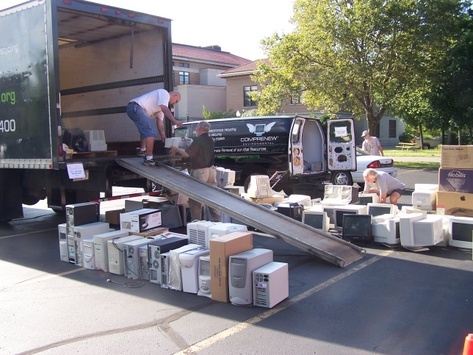 Comprenew is the only nonprofit electronics recycler based in Michigan, and one of four in the world, that holds both R2 and e-Steward certifications.